You are going to Watch Naruto Shippuden Episode 315 English subbed online free episodes with HQ / high quality. 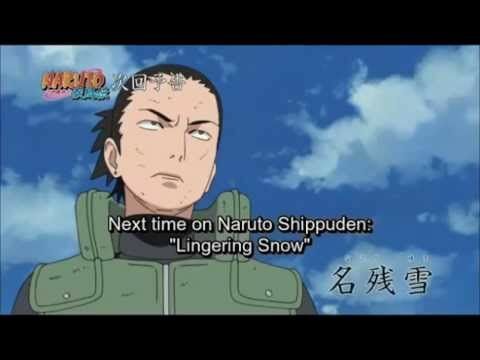 Stream Anime Naruto Shippuden Episode 315 Online English sub Lingering Snow. Discovering that there are four Yota in different battlefields, and recognising Yota’s whistling as the one he had taught him, Naruto informs the others that the Yota they’re fighting are in fact disguised White Zetsu, freeing them from the guilt of attacking Yota, resulting in the Zetsu being defeated. Remembering the past, Yota was being held by the ANBU for questioning, the ANBU sensing something wrong with Yota. Naruto acts a decoy for Shikamaru, Kiba, Akamaru, Ino, Chōji and Sakura to sneak in. Shikamaru manages to temporarily paralyse the ANBU, but they soon get the upper hand.